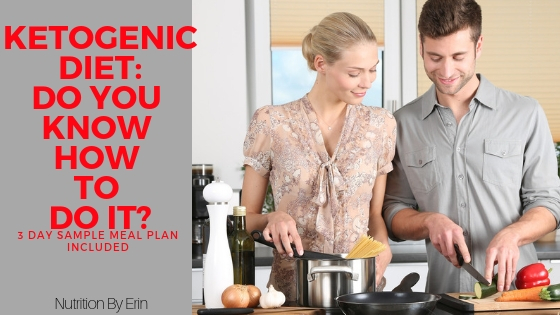 You’ve heard about the Ketogenic Diet (KD) and the many health benefits that come with it. But now what? How do you actually do it? In this article, you’ll get all the details you need to know to follow the KD, including a comprehensive 3-day sample meal plan! In the first article of this blog series, we discussed how the KD is a high fat, low carbohydrate diet. This article also covers its many health benefits like improving weight loss, epilepsy, metabolic syndrome, PCOS, diabetes, cancer, Alzheimer’s disease, and athletic performance. Now, let’s review the basics of the actual diet so you can reap all of these potential benefits. The Food and Nutrition Board of the Institute of Medicine sets Recommended Dietary Allowances (RDA) for macronutrients. Macronutrients are the three main nutrients one can consume for calories and they include carbohydrates, proteins, and fats. No other nutrient contributes calories to the diet. The RDA is the average level of a nutrient that a person should consume in order to meet the requirement of healthy people. Carbohydrates: 130 grams per day (45-65% of your daily calories). The KD focuses on high fat, low carbohydrate intake so the macronutrient ranges looks quite different than what you’re used to. See the comparison below of what the Standard American Diet (SAD) looks like versus the KD. On the KD diet, carbohydrate content is typically less than 50 grams of net carbohydrates per day. This can be challenging to achieve as all plant-foods contain at least some amount of carbohydrate. Healthy foods like fruits, veggies, legumes, and grains contribute carbohydrates in varying amounts. Net carbohydrates is something to be aware of when monitoring your carbohydrate intake. By monitoring net carbs instead of total carbs, you’ll more clearly see the influence of these carbs on your blood sugar levels. Remember, fiber is not absorbed, does not contribute calories or glucose, therefore, it should not be counted against your carb count for the day. Additionally, there are various sugar alcohols that don’t really impact your blood sugar level as there is some degree of malabsorption involved after you eat them. Many “diet products” contain these sugar alcohols like erythritol, mannitol, xylitol, sorbitol, etc. For simplicity’s sake, most just divide sugar alcohols grams by 2 and then subtract this from total carbs. There may be specific nuances to this rule based on the type of sugar alcohol, but this article will dive into that topic. 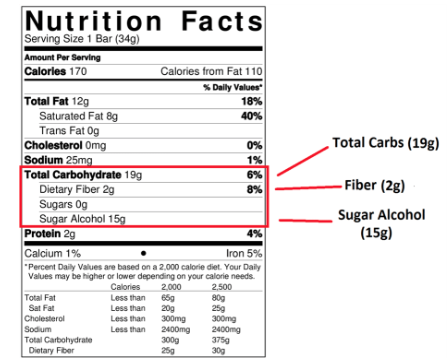 Unfortunately, you’ll have to calculate net carbohydrates yourself because it won’t be on the nutrition fact label, but it’s fairly easy to do. Adequate protein intake is important on the KD. However, people on this diet commonly make the mistake of over-doing protein foods. Protein is not a “free-food” and can potentially cause problems in achieving ketosis. This is because of the process known as gluconeogenesis. Gluconeogenesis is a metabolic pathway that can produce glucose from protein. By consuming more protein than necessary, you could get “kicked out” of ketosis due to this extra glucose production. You can calculate protein needs based on a percentage of total calorie intake (~15-30%) or on body size (0.8 to 1.2 grams per kilogram of body weight). Keep in mind that if you are overweight/obese according to your BMI, then sometimes body weight estimates can overestimate your protein needs. While these numbers are not exactly the same (90g v. 82g), they are fairly similar and help meet the basic protein needs of this person. Fat intake should be the highest intake of all with a whopping 70% of fat from your total calorie intake. This is the most drastic diet change, as most people eat about 25% of their calories from fat. The best tip to truly get into ketosis is to eat more fat than you even feel comfortable with! Drizzle oil and butter on all your foods. To calculate your macronutrient content on the KD, there are many applications you can use. One of the most popular and free diet tracking apps is MyFitnessPal, but this does not assess your net carb count. Carb Manager is a great option specifically for the KD. Here’s a list of some of the top-rated apps for keto. At minimum, keep track of your food intake in a notepad for the first few weeks, as this is not an intuitive diet. Keeping track of your food, portions, and net carb grams (per meal) is a great place to start. After you get into the flow of the diet, tracking is no longer essential. Overall, to do the KD you will need to focus all of your attention to your macronutrient intake. You will have to consume approximately 10% carbohydrates, 20% of protein, and around 70% of healthy fats. In order to properly consume these macronutrients, it’s helpful to use any of the tools listed above to calculate your exact macronutrient intake throughout the day. It can be challenging to get started and stick to the KD plan. Work with me to help guide you through the process, get a personalized meal plan, and the accountability/support you need for success! Below is a sample of a 3 Day Ketogenic Meal Plan that you can follow in order to start your KD today!